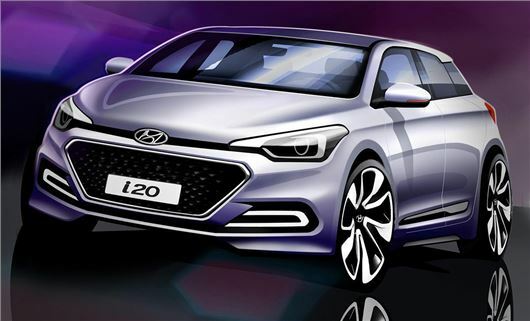 Hyundai has released the first preview images of the next generation i20, which is set to be revealed at the 2014 Paris Motor Show in October. Sales should begin in early-to-mid 2015 and you can expect prices to start at around £10,000. The sketches reveal a lower, wider, longer and more purposeful-looking car than the outgoing model, with a sleeker appearance helped by a low roofline. Hyundai’s ‘Fluidic Sculpture 2.0’ design language has been employed, which is meant to give a flowing shape. Details about final pricing and technical information are to be announced, but expect the i20 to use the 1.6-litre petrol and diesel engines from other models like the i30, along with a 1.2-litre petrol familiar from the i10. Equipment should be generous, with air conditioning, Bluetooth and USB-connectivity among the likely standard-fit items. The outgoing i20 competes in rallying, so it's even possible that we'll see a sporty hot hatch variant of the i20. Hyundai's sister brand, Kia, has introduced a 200PS version of the Cee'd, using a turbocharged 1.6-litre engine - an engine that would fit a hot Hyundai i20 well, albeit with slightly less power. Hyundai has mooted the possibility of high-performance models in the past - click here for more information. Yet another car with no windows & rubber band tyres....... if you believe artists' sketches are reality! !